Why did I read this book: Although the premise sounds like pretty standard YA science fiction dystopian fare, I was intrigued by the synopsis of the book. For as long as Tania Deely can remember, she’s been told that she’s special. Just a few short decades ago, natural human reproduction simply ceased, and the birth rate across the globe plummeted. Just a handful of children are born each year – a statistically insignificant number in the grand scheme of the world’s population – and humanity faces the very real threat of extinction. The result of childlessness is social panic and violence (aka “the Troubles”), leading to a dark period of time in human history. But then, there was Oxted. To alleviate the Troubles, the Oxted corporation promised hope: highly advanced androids, in the guise of perfectly human-seeming children, leased by eager parents for a period of eighteen years. These “teknoids” (from the Greek teknon, or child) grow up in the same way as human children, forming personalities, learning from their parents and peers, and require only a few routine “revisions” to adjust their bodies as they age. And, at the ripe age of 18, Oxted will reclaim its property to be reduced, reused, or recycled. In this brave new world of android children, eleven-year-old Tania Deely grows up believing that she’s one of the rare few real humans. She sneers at her former friends who have clearly had their body revisions over summer holiday and are therefore robots, just like the rest of her classmates. But as Tania grows up, she realizes that what she’s always been told as a child is not true at all – human children are far fewer than she ever realized, and Tania herself may not be one of them. The debut novel from William Campbell Powell, Expiration Day is Tania’s story, an epistolary journal entry-narrated account of her life from eleven to eighteen years old. It tackles the requisite questions of defining humanity – what does it mean to be human? Can robots have souls? If robots can think and feel and produce art, what rights should they have? And so forth. What’s so fascinating about Expiration Day, though, is the way in which it tackles these questions. I should interrupt this review quickly to say that the descriptive blurb about the book (as provided above at the top of this review) is…wrong. Or deliberately misleading, at the very least. This is not a story about Tania fighting to learn the truth to save her robot friend Siân; rather, it’s a story of self-discovery and growing up. The other thing that the description leaves out is the fact that Tania’s story has a second narrator – someone from the distant future from a species simply called “The People”, who are ancient and long-lifed, who have been searching the galaxy for centuries for other signs of intelligent life. This second narrator is part anthropologist and historian, who has discovered Tania’s journal entries from a long dead civilization, and who is reading and commenting on her life in chapter interstitials. I loved this narrative setup. From the onset of the book, it’s painfully clear that humanity is facing an extinction event crisis – if no one can procreate, by natural or artificial means, then humanity faces the very real threat of dying out in a few generations. The narrative, with its third party alien observer, confirms this sad inevitability. And, while humanity grapples with its own demise, it responds by creating life in an unexpected way with its teknoid children. Why then, does Oxted recall its robot children when they turn 18? Would it not make sense, then, to keep those robots alive as humanity’s natural successors? Well… this is a question addressed in the book, too, beautifully. Beyond the larger thematic questions of what it means to be human and the cost of life, Expiration Day succeeds as a book because of its micro-focus on protagonist Tania. Tania, who grows up with each journal entry from naive eleven-year-old (who believes she is a very special girl in a sea of androids), to hopeful and brave eighteen-year-old young woman who still knows she is special and loved, if in a very different way. Tania’s narration is frank and funny, full of insight when it comes to the adults in her life and her peers (both robot and human alike). She details the mundane, from her assignments at school to her participation in the class Shakespearian play; Tania also exudes her powerful personality, with her powerful connection to music – particularly her first discovery of and love affair with the bass guitar. She talks about first crushes and kisses, her friendship with best friend Siân, the first pangs of loss and how Tania copes with the death of someone dear to her. Of course, Tania also questions the makeup of her world: the reasons why robots exist, why they are discriminated against, why certain things about their nature are kept secret from the robots themselves. She questions the government (or the “State” as she thinks of it at one point), which monitors all communications and searches, and the faceless multibillion dollar corporation that sits behind it all. One of the things that I loved the most about Expiration Day is that the easy dichotomies that one expects from this type of story (e.g. Evil Corporation Recycles Your Robot Children Because It Is EVIL!) are decidedly not the case in this book. The impetus for teknoid children, for the expiration date, for humanity’s future itself all makes a beautiful, morose kind of sense in Powell’s novel. There are no easy happy endings here…but there is hope, even with the inevitability of death. All of this, and more, is relayed in Tania’s heartfelt, incisive narrative. These praise said, Expiration Day is not without its flaws, and there were a few sticking points that should be mentioned. First, a relatively trivial point (but it’s a huge pet peeve of mine, and it actually doesn’t make sense in the framework of the story – thus breaking the illusion that a young girl named Tania is writing the book): It always makes me laugh a little bit when authors glorify the power of the paper book. That is, there are a couple of references in Expiration Day when Tania revels in the beauty of the bound book in its paper format. (e.g. “I’d want to bring my books […] paper if I could. I need to understand…I’m reading the Great War poets, John […] Maybe reading a paper book, like they had, will help.”) (Note that there aren’t any similar nostalgic trips for vinyl records or older wooden amplifiers, even thought Tania is a musician and this is a big part of her character.) Would this society so far and so different in the future, and a girl who has grown up her entire life with digital books, be so nostalgically focused on an obsolete technology? My guess is…no.. I find the repeated projections of the magic of paper books (as opposed to their so-called lesser digital components) to be both amusing and irritating (and self-insertionist on the part of whomever is actually writing the book) – but, again, this is a personal pet peeve of mine and negligible in the overall scheme of the story. On a more serious note of criticism, however, there are more serious moments lacking authenticity in Tania’s epistolary narrative. At times, her diary reads as though a grown man is trying to write the voice of a teenage girl, complete with some of the trappings of the dreaded male gaze. I like that Tania is open with her appearance and sexuality (which is awesome to read, especially in a YA novel), but there’s some weirdness in her internalized justifications for the reasons why girls dress the way they do (e.g. To get boys’ attention, duh! That’s the only reason we like dressing in certain clothing, obviously!) and fixation on breasts. These jarring moments aside, Expiration Day‘s many strong notes drown out the occasional missteps. Much like Tania and her fledgling band, once the book gets going, it is an awe-inspiring thing of beauty. Expiration Day is unexpected, it is unique, and it is utterly memorable. Suffice it to say, I loved Expiration Day very much, and I hope that others give it a chance. Absolutely recommended, and in the running for one of my top books of 2014. What a funny old day! We got a robot today. And it was my eleventh birthday. So I thought I’d start to write a diary, because it was a weird day, and if you can’t even write a decent diary when you’ve got something to write about, what chance have you got when the days are dry and dreary? But I’m not going to start every entry with “Dear Diary” or anything so Victorian. That would be just so wet. Anyway, I want to decide who’s going to read it. Whoever you are, my distant, unknown friend, I need to see you in my mind. No, I don’t hope any such thing. If I have to become anybody’s granny, please don’t let me be a boring granny. Instead I shall be a grand Dame, knighted for my services to the country, and I shall tell fabulous stories, mostly true, about my adventures as a spy, or a detective, or an actress. So by 2128 you’ll need me, whoever you are, because there won’t be many like me left. Do you have churches in Andromeda, Mister Zog? Weddings, christenings, and funerals? Too much detail, I think, at least for today. Anyway, my dad is a vicar. And in these times he has a lot to do. He says thirty years ago the churches were empty. Now they’re full. Full of unhappy people, looking for help to make things bearable. Looking for the little rituals that make things feel normal. The church business is good. But vicars are still poor. Mum says he’s keeping half the village sane, but still we live on people’s cast-offs. We have Value Beans in the larder. Our vid is someone’s old 2-D model. And our “new” robot is a reconditioned ’44 model, donated by a kindly parishioner. We called him—the robot—Soames. It seemed like the perfect name for a 1930s butler—right out of an Agatha Christie 3-Dram. Dad activated him, and I watched as the eyes lit up for the first time. I asked Dad about that, and he smiled. We had to do an imprinting, of course, to get Soames to recognize the voices of his new owners, so that he’d obey our orders. “Michael Deeley, primary registrant. Acknowledge.” That was Dad. “Annette Deeley, secondary registrant. Acknowledge.” Mum. “Tania Deeley, junior registrant. Acknowledge.” Me, reading from the instruction manual and sounding very formal. And that was it. Soames would obey Dad, then Mum, then me. In that order. There were a bunch of other commands built into his brain that we couldn’t override, sometimes called the Asimov Laws, after some ancient writer who came up with the idea. Dad says Asimov’s original laws were very simple, but Soames’s version had been made very complicated by the lawyers. So under stress any robot just became completely useless. Anyway, we put Soames to work doing the washing up. He didn’t break anything, but I could have loaded up the dishwasher myself in half the time. Tomorrow, though, he will be faster, because he’s learned what to do and where to put the plates afterward. And then, because it was the summer holidays, there was no school, so I got him to play table tennis, because it was my birthday and Dad said I deserved a treat for that. Soames spent most of the time picking up the balls, when he didn’t crush them underfoot (two destroyed) or knock them into the lamp shade (one out of reach). Then we took him around the house, showing him where everything was. So we can tell him to tidy the house now, and everything will find its way back to where it was on my eleventh birthday. Or whenever. Okay. I’m not frightened of domestic robots, honest. But can you make one that can play table tennis, please? This book completely surprised me in a good way and my father, a long time sci-fi fan is now reading it and loving it. I had to convince him to look past the blurb and the cover. I had wished at points that there had been a little more explanation of various aspects, I wanted to see more of the world but loved what was shown. This author is definitely going onto my to-read list. The questions raised by this book seem similar to those explored in the movie I, Robot: what it means to be human, to be creative, to think or to have a soul. Thanks for the review. Victoria Van Vlear – YES! 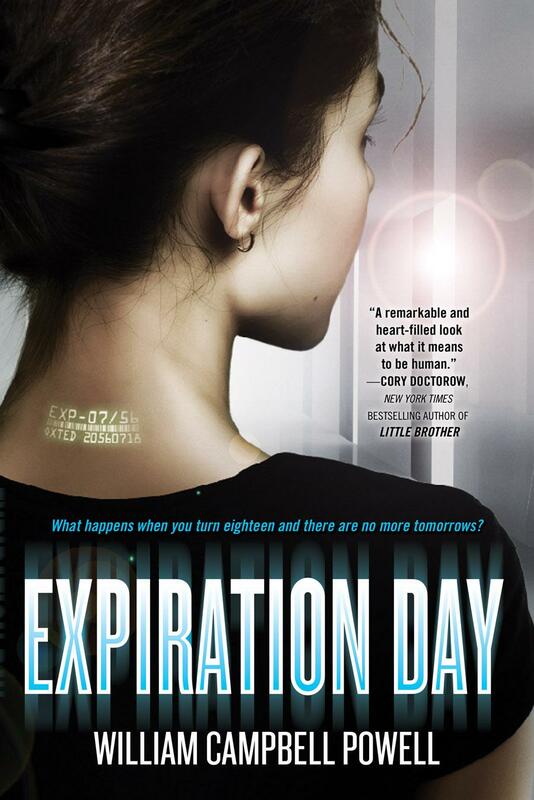 And there is mention of Asimov (not the movie, but the stories) in Expiration Day. As well as shades of 1984. I hope you’ll give this book a try and let me know what you think! I can’t read e-books. It’s a weird thing but without the physical book in my hand I just can’t remember what I read. Even weirder since I have word perfect recall of everything I read off paper. Possibly it’s because I remember what I’ve read by closing my eyes and calling up the image of the page. I’ve heard a lot of people say “E-books are the future, ludites just need to get used to it.” To which I shall say, some people are naturally drawn to the physicality of books and you just need to accept it.